You can't talk about carbon fiber without using words like "thin" and "lightweight" and "capable of withstanding huge amounts of punishment." And when you're a company that specializes in materials that outperform and outlast everything else, your ears perk up like a dog's the moment you hear that carbon fiber is four times stronger than steel. Its incredible properties and cool look is what inspired us to feature an extensive collection of carbon fiber rings right alongside some of our roughest and toughest metal-based designs. What is carbon fiber made out of? Carbon fiber was technically discovered in the 1870s by no less than Thomas Edison, but these early fibers weren't exactly CF as we know it today. Edison created his carbon fiber by baking thin strands of cotton and bamboo, which is sort of like the material equivalent of cooking table sugar with a grill lighter and then saying you invented caramel candy. Today's carbon fiber is literally a product of the Space Age. It was first developed in the late 1950s near Cleveland and then refined by aerospace agencies in Japan, the UK, and elsewhere. Modern carbon fiber can be made from a range of materials, but the CF in our rings is woven from polyacrylonitrile (we can't pronounce it either, but everybody just calls it "PAN"), the same synthetic polymer you'll find in airplanes and racing vehicles. How are carbon fiber rings made? PAN was discovered in the 1930s, which if you notice is two decades before modern carbon fiber was developed, but the researchers who first synthesized it gave up on the material after they couldn't figure out anything useful to do with it. It wasn't until the 1940s, at the height of World War II, that another scientist named Herbert Rein came up with a method to create special PAN fibers, which are now used in most CF production. Carbon fibers start as white strands, but once they are heated in the Oxidation stage, they brown and then blacken, which in principle is pretty similar to what Edison was doing with cotton and bamboo all those years ago. But then, after the fibers have oxidized, they are superheated until they become nearly 100% carbon fiber, which is why this is called the Carbonization stage. After the PAN has carbonized, the new fibers receive a chemical treatment that makes it easier to weave the super-tough fabric twill that most people think of when they think of carbon fiber. From there, we are able to size, shape, and finish the ring. Where else is carbon fiber used? This is gonna sound cliché, but carbon fiber is so multifunctional it's almost easier to list all the ways CF isn't used. If something exists that would benefit from being strong, lightweight, flexible, and hard to set on fire, then there's a good chance someone's made it out of carbon fiber. Here are a few other applications: airplanes, space shuttles, missile systems, firearms, knives, racecars, regular cars, motorcycles, bicycle frames, boats, sails, awnings, filtration systems, sound systems, fishing rods, tents, other sporting goods, bassinets, flame-resistant clothing, prosthetic limbs, dental work, even concrete. How do 100% carbon fiber rings differ from your other carbon fiber rings? A lot of rings that are marketed as carbon fiber are actually metallic rings with a carbon fiber inlay. There is nothing wrong with that. In fact, more than a few of our favorites fall into that category. But our 100% carbon fiber rings are, you guessed it, all CF, all the time. 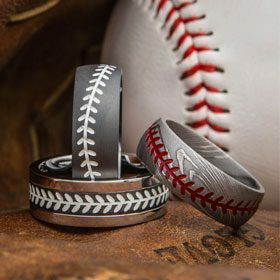 The 100% CF rings are made by some leading composite artists who are experts at precision weaving, molding, and shaping carbon fiber with exacting precision. They are hand-finished and inspected to guarantee their quality. Want to know the best thing about these rings? Here's an inside tip: Take them outside and hold them up the light on a sunny day. You'll see what we mean. Isn't it weird to wear a ring that's not made out of metal? It depends on how you define weird, but we get it. 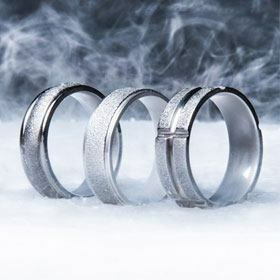 These rings do feel different to wear, but you'll be blown away by how comfortable they are and the strength of the design. If you can handle wearing a metal ring, you can definitely handle carbon fiber. 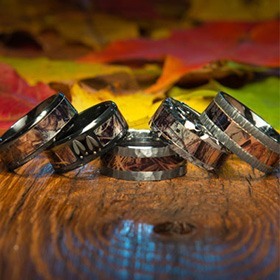 And while it is true that these rings buck tradition, how wild you want to get with them is entirely up to you. We happen to think that most of our carbon fiber rings fall on the classier side of the spectrum and are just as stylish and sleek as anything else out there today. I heard carbon fiber rings don't fit the same way as other rings. Is that true? Don't worry. 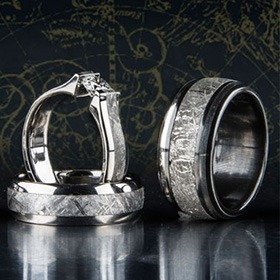 We have set up standardized sizing so all of our carbon fiber ring sizes exactly match the sizes used for traditional rings, same as if you were shopping for something in gold or silver at a jewelry store. That said, and we can't stress this enough, know your actual ring size before you order. But what if mine needs to be resized? If you know your true ring size, then you're probably safe, but we understand that things happen. We also know it's a sad fact of life that nobody stays the same size forever -- not in our fingers or anywhere else, for that matter. But if your ring stops fitting properly, can we resize it? Unfortunately, no. The way these rings are made makes resizing impossible. Most of our carbon fiber rings are eligible for our Protection Plan. Purchase of the plan includes one free size exchange for the first year you own your ring. All you'll pay is shipping. If you have any questions or concerns about the fit of your ring, please call us toll-free at 1-866-215-1861 or send us an email. Are your carbon fiber rings coated or treated with chemicals? Nope. There are no lacquers or epoxies added to our rings. We prefer an all-natural finish, which we achieve by carefully sanding each ring. We think carbon fiber rings finished this way are cleaner, sleeker, and wear better over time. Is a carbon fiber ring right for me? Carbon fiber rings aren't right for everyone, but, then again, no ring is. That's a big part of what drives us to keep coming up with new designs and to keep featuring new materials. Here's the one thing we can say about CF, though: It's not just another fad. The trend may be new, but these rings are here to stay. They're bolder and a bit different, which is why we love them, and if you're looking to break out of the mold while still looking great, then there's a good chance that one of these rings is right for you. The best way to find out if one of our CF rings is right for you is to check 'em out for yourself. Visit our complete collection and experience the power of carbon fiber.